Ricky Gervais Heading Back to "The Simpsons"
Ricky Gervais hosts the 67th Annual Golden Globe Awards at the Beverly Hilton Hotel in Los Angeles. Funny man Ricky Gervais is set to make a return visit to Springfield this fall in a guest turn on "The Simpsons," according to Entertainment Weekly. The cheeky Brit both penned and stared in a 2006 episode of the show called "Homer Simpson, This is Your Wife," in which he played a beaten down husband who make an appearance with Marge and Homer on a reality show. 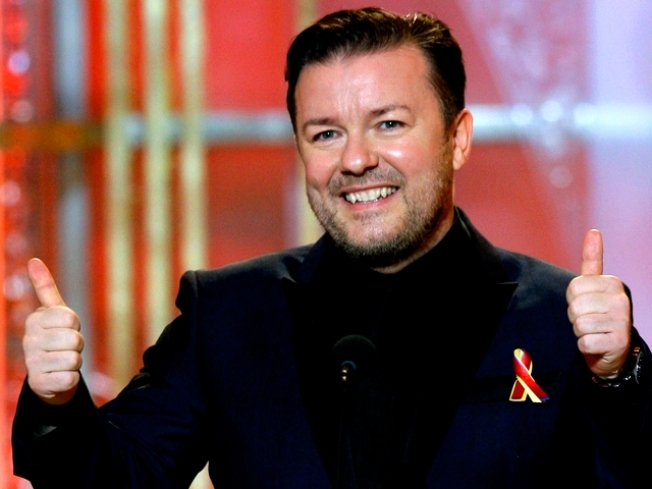 In the forthcoming episode, Gervais plays himself when Bart and Homer visit Los Angeles for the Oscar awards. Gervais, a co-creator and star of the original "Office," is one of a long line of big-name celebrities lined up for season 22 of "The Simpsons." Jon Hamm of "Mad Men," Paul Rudd, Daniel Radcliffe, Hugh Laurie and Martha Stewart are all slated to lend their voices to the show this year.